Back in January, I had the chance to capture a swarm of bees. My friend Allen the Beekeeper called me out of the blue while I was hanging out with my cousin Jen, a fellow homesteading/gardening enthusiast. "Hey Dave - want to go catch some bees?" My answer - of course - was yes. Allen and Dave star in UPN 33's late-night movie The Andromeda Strain. The next morning we set off for a rental house in a residential neighborhood. The landlord had been told there were bees there, so she called Allen to get rid of them. Jen joined us and documented the experience with photos and video. (Final Cut is giving me fits right now. I'll figure it out and post the video in the future... I hope). 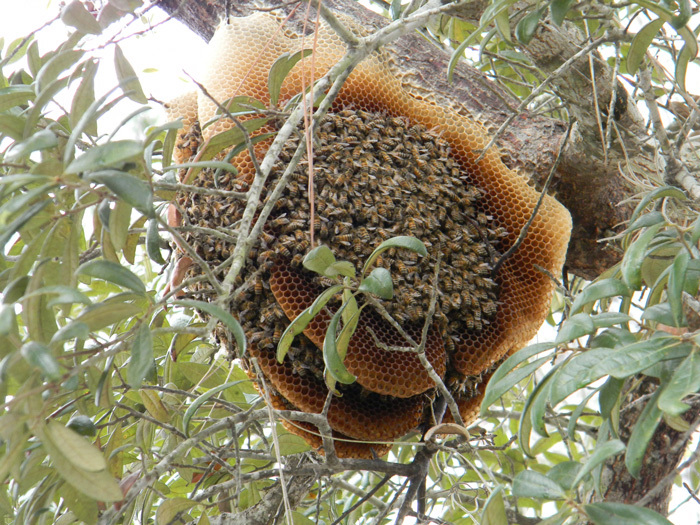 Even though it was winter, the bees had swarmed - and then built a hive- right out in the open. I've never seen anything like it. Right on the side of an oak, about 12' up, there were perfect hanging pieces of comb, covered with bees - and filled with larvae and honey. Totally bizarre. I can't figure out how they were surviving the cold out there. I climbed up and cut them down as Allen rubber-banded them into hive frames, then put them in a nuc box. After that, we brushed as many bees as possible into the box and prayed we got the queen. (Well... I prayed. Allen's a born-again pagan, so I suppose he willed good karma at it). 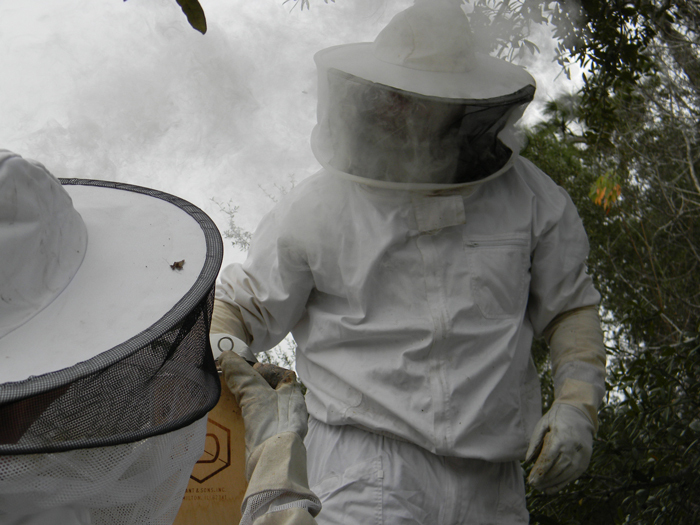 At any rate, we boxed up all the bees we could get, then Allen installed them in my backyard. Jen - our adventuresome photojournalist. Some days later, we busted open the box and found there was indeed a queen in there. Hurray for bees! It's been a few years since I kept bees... this was something I was really missing. Thanks to Allen and these batty out-of-season-swarmers, I've got 'em again. I have had bad luck with feral hives. I quickly learned that they were killer bee hives. They were super aggressive. I spoke to the FL apiary inspector who said all feral hives should be treated as africanized. I was a hobby beekeeper for 7 years ending about 7 years ago. I would get back into it if I could find a reasonably priced honey extractor. Thanks for stopping in. I haven't had much trouble thus far. Allen has culled hives that exhibited seriously aggressive natures, though. I also don't trust the Apiary inspectors: their job is to contain and control on behalf of the state more than it is to preserve bee genetics. Capturing feral swarms allows tough genes back into the mix and can be one of the tools we use against CCD. Personally, I believe that Africanized bees may just save the European bees by sharing their genes. They're much better at staying ahead of pests... we just need to watch out for their violent tendencies. I hope you do more posts on your beekeeping adventures this year. I'm planning to have bees for the first time, but I'm getting them the safe way - in a package in the mail. Congratulations and good luck. I'll keep you posted - and if you post anything on your own experiences, let me know and I'll link to it. but I have to comment on the previous post about not capturing ferral bees..PAH B.S.! Dont get me wrong I for one respect and appreciate the state inspectors for what they do.They really do a good job with helping beekeepers out,and yes they do track where the AFFIRCANISED bees are at..((careful I'm about to say something risky here..BUT REALLY WE are mostly safe.)) Bee aware! Yes there are risks in SAVING bees, but in looking at the enviroment around us, WE should do what we can. What many dont realise is 30-40% of our food is affected by bees and or "pollinators". I'll wait, repeat it aloud.. I dont know about you but thats scary and I'll tell you why. those over 30...think back ..when was the last time you saw a field of fireflies?,around you, and away on their business. they all pollinate ..not nearly as well as Apis, but they do...if they are gone, who is left to pollinate our food?flowers? 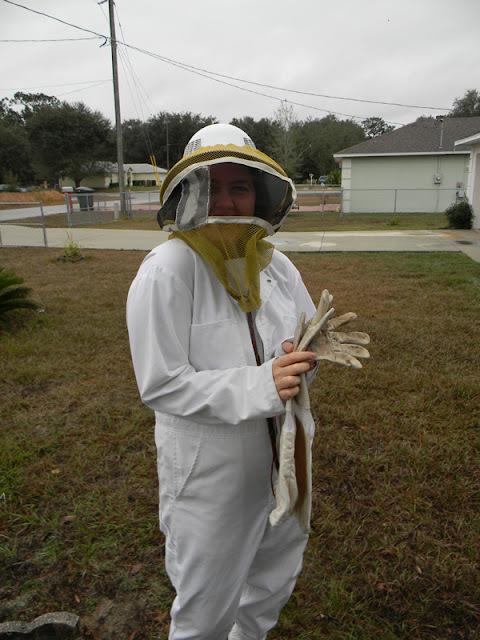 How many apis mellifera colonies do you know of?